The Wooden UI Kit contains various elements for your own natural interface. These include a “paper pad” style text note, accompanying close/continue buttons, a search bar, “view” buttons, email subscribe box, and a popup notification. This beautiful icon set consists of 10 images related to education and academia. They are provided both as a 128px PNG, and in the original PSD format. This versatile icon set is provided as vector shape layers in Photoshop. The original PSD is included, making the icons fully editable. You can change the colors, mix and match elements, and customize them however you like! Based off of the Sticky Note, here’s our take on a realistic looking photograph. Enjoy! This is a completely different take on the usual social media icon set, adding a “fabric” style texture, stitching effects, and a range of different colours and patterns. It’s easy to customise the colours and style of these for your own design, or add extra icons for additional social networks. Hope you enjoy using them! A simple navigation element for conceptual designs. An extremely useful collapsing vertical navigation menu with smooth animations and four built-in color variations. The top section stays open and includes a welcome message, the other sections slide open on hover. This navigation menu uses media queries to achieve a fluid, responsive design that easily adapts to any size viewport and device. Three color variations dare included, each with animated hover styles. Just in case you want to return to a previous page. Just a simple navigation with some subtle colour and slick state designs. 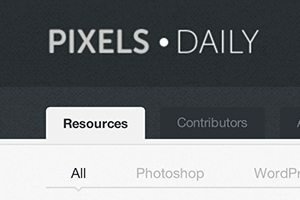 A nice, fat navigation bar with an eye-catching highlight. This user interface PSD is a gorgeous login interface. It takes design cues from the OS X login screen, with various form fields and buttons (each with an “active” state to give the form some extra functionality). A fresh, refined log-in window. Updated to work on light backgrounds and comes with a new green-colored button. An example section of a registration form with gorgeous subtle details. It’s split into two columns — a three step overview of the process on the left, and form fields, and upload box, and progress bar on the right. Just a quick little sign in form, no mess! A nice, simple little dark search field, including various states. This is a sleek, professional CSS and HTML slider design. It’s based on the Nivo Slider script, powered by jQuery — a fully functional piece of code that can slot in perfectly to your next site design! We really hope you find it useful! This download includes a simple animated label that appears over an image on hover. To ensure versatility, ten different options have been included, each of which slides in from a different direction or rests in a different location. This thumbnail gallery utilizes a collection of circular images laid out on a grid. When the user hovers over an image, the background comes to life and a text label pops up. Normally this kind of thing would require CSS background images, but this project allows you to insert your images right into the HTML, which is the ideal route for an image gallery. Give your images some character by applying an effect that makes them look as if they were taped to the background. A total of six different tape combinations are included so you have a lot of variety to choose from. This download includes a super easy to implement 3D text effect that uses pure CSS and live, selectable text that can be easily customized. We’re doing our best to make Creative VIP your favorite place to access premium design resources. To do that, we need your feedback! What other types of content would you like to see? Leave a comment and let us know.